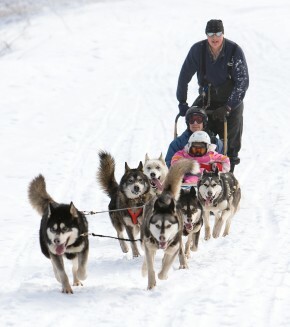 yip, howl, whine and bark, their eyes on Mills, their bushy Husky tails curled high. 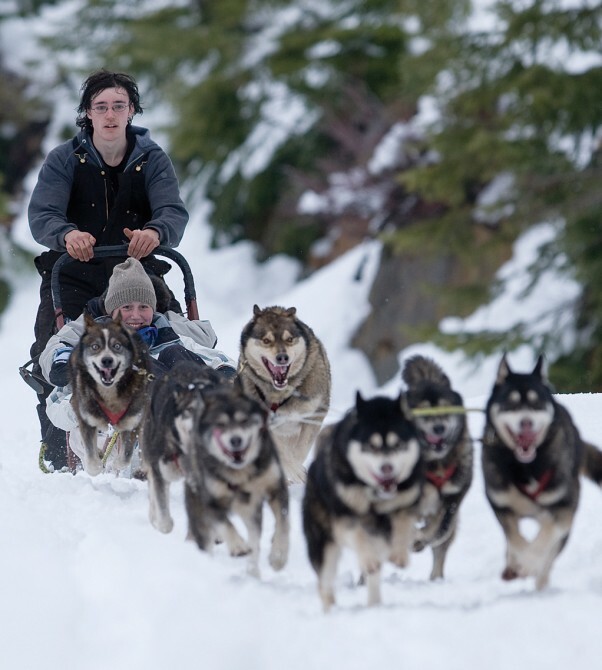 If they weren’t securely attached to a strong chain, which is anchored to Mills’ parked truck, they’d be leaping toward us—60-odd pounds each of solid muscle and single-minded focus, driven by what seems to be a deeply-embedded instinct: the urge to pull a sled over a snowy track. 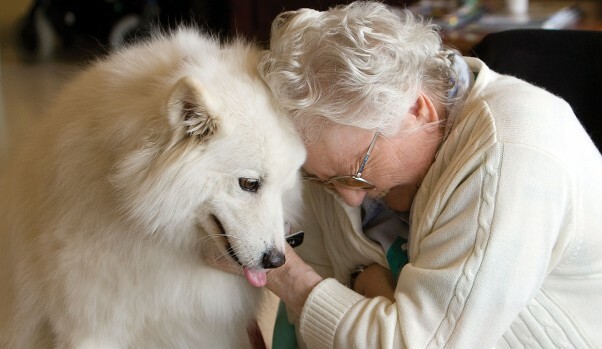 It’s easy to see why Samara, a 10-year old Samoyed, is a beloved pet. Her luxurious white fur calls out to be petted, her dark eyes brim with steady affection, and the curl of her bushy tale clearly says “happiness” in a language everyone can understand. But Samara is much more than a pet. She has an occupation. In fact, it wouldn’t be much of a stretch to call her a health care professional. Samara works one-on-one with seniors who face multiple, often debilitating, health challenges; she teaches life skills to youth with Fetal Alcohol Spectrum Disorder; she even helps children learn to read. She has been credited with bringing people back from the brink of death, and has helped ease the passage of those who can’t be brought back. Samara has spent the last eight years as a therapy dog with the Comox Valley division of the St. John’s Ambulance Therapy Dog Program. Every Monday afternoon, Samara, along with her human guardians, Dave and Carol Fletcher, is on duty at The Views, St. Joseph’s Hospital residential care unit. She also regularly visits Abbeyfield House and a number of other facilities, she assists in evaluating and training new dogs for the program, and she accompanies Fletcher to speaking engagements and community events as a canine ambassador for the program. All in all, it’s a job that requires lots of time, dedication and a variety of skills. I see these in action one Monday in mid-February when I accompany Samara, Dave and Carol on their rounds at The Views. As we get started, Fletcher points out, with obvious pride, that this is Samara’s 701st visit. The Views is both a heart-wrenching and a heart-warming place. Heart-warming because you can see how much care and energy goes into making the residents’ lives comfortable and meaningful. The staff is kind and attentive; there are big windows letting in light and a view of the estuary; there are bingo games, card games, manicures, visits by a hairdresser and other organized activities. But it is also heart-wrenching, because regardless of all that, The Views is still an institutional setting, a far cry from the warm embrace of a family home. Residents of The Views often have multiple medical conditions, such as dementia and limited mobility. Quite a few are in wheelchairs. “For most people, this is their final address. The average life-span of people who move here is five months,” says Dave Fletcher, who as well as being Samara’s guardian is also the unit facilitator of the local St. John’s Ambulance Dog Therapy Program. Samara’s role, in this setting, is to cheer people up and encourage them to connect to the world around them. She is very good at her job. Dave leads Samara around The Views on a leash, stopping to meet people in the hallway, visiting residents in their rooms, and making their way around tables in the common area. It is there that Dave spots Mike, reclining on his wheelchair. His facial muscles are slack, his eyes unfocused. Dave heads over to Mike, pulls a chair up beside him, and motions for Samara to jump up onto it. Many of The View’s residents need Samara to come to their level so they can see and touch her. For a moment Mike’s eyes remain dull, his face passive, but then a bright spark of interest shines as he recognizes who it is. Slowly, he turns his head, which is supported by a headrest on his chair, in Dave and Samara’s direction. Dave says hello and moves easily into friendly small talk as he reaches down, picks up Mike’s hand and places it into the soft fur of Samara’s neck. As his hand connects with Samara’s warm body, Mike’s face transforms—the change that comes over him is as dramatic and uplifting as when the sun suddenly emerges from the clouds after hours of rain and gloom. His hand works in Samara’s fur, and he starts to answer Dave’s questions. Samara sits calmly, looking right at Mike, and, I would swear, smiling. This sort of scenario repeats throughout Samara’s hour-long visit. It has been proven that therapy dogs can improve physical and mental health, enhance vocabulary and memory, and increase sociability and movement, and that petting a dog reduces stress, lowers blood pressure, distracts from chronic pain, and helps people deal with grief. But it is one thing to read these assertions in print and quite another to see it in action. Many of the residents know Samara, and are ready for the weekly visit with dog treats stowed in their pockets.